and other information are given below. 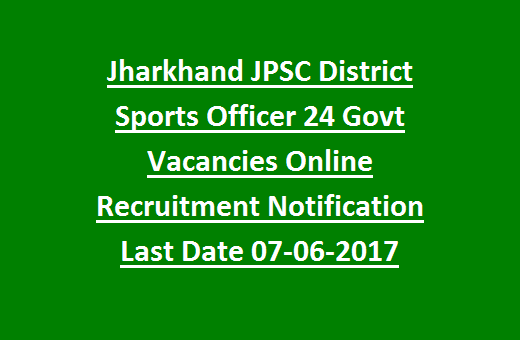 See the official notification of Jharkhand JPSC Sports Officers Recruitment. JPSC Online applications starting date: 17-05- 2017.
age limit of 35 years as on 01-08-2017. Upper age limit for EBC, BC candidates is 37 years. Upper age limit for UR, EBC, BC Female candidates is 38 years. For SC, ST, Ex Serviceman candidates is 40 years. is Rs. 9300/- to Rs.34,800/- plus Grade pay of Rs. 4800/-. conducted by the selection board. marks with the duration of 06 hr. Paper I: 200 marks- 03 hrs. Paper II: 200 marks- 03 hrs. Bank Charges paid through Debit/ Credit/ Internet banking/ bank challan. using the Jharkhand PSC Recruitment link @ www.jpsc.gov.in. online application registration process starts from 17/05/2017 to 07/06/2017.